Glamping is all the rage in tourism. Not familiar with the term? It’s simply the camping you remember as a child combined with the amenities and creature comforts that most modern travelers have come to expect. Long before this type of eco-tourism was “mainstream” Stanley Selengut, founder of Concordia, had a vision of low-impact tourism that was managed in harmony with the natural surroundings of the island of St John. His vision became the much-loved [ recently closed ] Maho and Concordia Eco-Resorts on the island of St John in the US Virgin Islands. 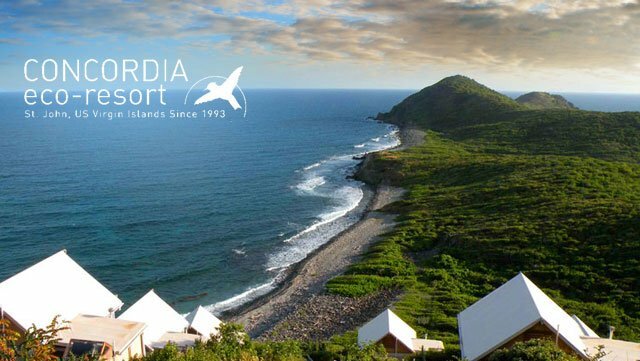 Concordia Eco-Resort’s 51 acres is located on St John’s rugged and beautiful south eastern coast. Built into the hillside the resort enjoys dramatic views of Drunk Bay, Ram’s Head and Salt Pond Bay; as well as wonderful trade wind breezes off the ocean. The resort’s architect, Glenn Speer, used green building techniques whenever and wherever possible to create a unique development that truly respects its place on this special island. … come in two flavors …studio or tent. Studios have solid walls, floors, doors and windows with AC electric. Tents are wood framed with soft walls, zipper windows and use 12 volt DC via solar electric. AC and TVs are not available. These units are perched further east along the hillside with stunning views overlooking BVI, Drunk Bay, Ram Head and Salt Pond Bay, taking advantage of the cooling trade winds. Rates are from $125 Low Season, to $195 Peak Season. Fifteen independent units perch like tree houses along the hillside. Most units sleep 5 comfortably, a few of them will accommodate 6. Rates from $110 Low Season, to $165 Peak Season. Our 8 newly constructed Eco-Studios sleep 4 with a queen bed and queen futon. Each unit varies slightly in design and decor; each have deck with stunning views. Rates from $165 Low Season, to $255 Peak Season. Each Loft can accommodate 4 to 6, with a queen bed, a queen futon, and space for two roll-away beds, full kitchen, wraparound deck and full ocean views. Rates from $165 Low Season, to $255 Peak Season. Each Full Kitchen Queen can accommodate 2, with a queen Bed and two roll-away beds, full kitchen, wraparound deck with garden view. Rates from $140 Low Season, to $230 Peak Season. Each Efficiency Queen can accommodate 2 with a queen bed, kitchenette and private deck with garden view. Rates from $130 Low Season, to $180 Peak Season. Each of our Efficiency Futon units accommodate 2 with a futon sofa/bed, kitchenette, and private deck. Rates from $120 Low Season, to $165 Peak Season.